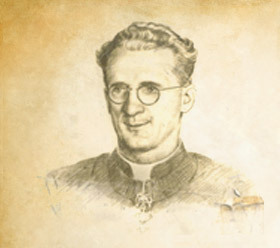 In Rome during World War II, Monsignor Hugh O’Flaherty organised an escape organisation for Allied POW’s and civilians. When the Allies entered Rome he and his colleagues had saved over 6,500 lives. Hugh O’Flaherty, a Kerryman, was awarded the highest honours, including a Commander of the British Empire, the Congressional Medal of Freedom and was the first Irishman named Notary of the Holy Office. He retired to Cahersiveen for the last three years of his life and in 1963 he sadly passed away. His death was mourned throughout the world, including a personal tribute in the New York Times. In Ireland however up to now his work has largely gone unrecognised although people have a recollection of his work through the 1983 Gregory Peck Film “The Scarlet & The Black” and more recently through a published biography “The Vatican Pimpernel” by Brian Fleming. Through the unveiling of the Hugh O'Flaherty Memorial on the 30th October, 2013, the Memorial Committee has achieved one of our key objectives which was to create a permanent and fitting tribute to him in his home town of Killarney. This and our other activities will help to raise greater awareness of his great deeds with young and old in the community, in Ireland and abroad. We hope that this and future generations will be inspired by Hugh O'Flaherty's incredible deeds and example and will in turn play their own part in making our world a better place. Brain Fleming author of The Vatican Pimpernel: "O'Flaherty was awarded the highest honours, including a CBE (UK), the Congressional Medal (US), and was the first Irishman named Notary of the Holy Office. Eight million viewers watched him in 1963 on BBC's 'This Is Your Life'. Within months he had died and his death was reported by papers allover the world. In 1983 he immortalised in the film, 'The Scarlet and the Black'. Yet the only monument to him is a grove of trees planted in Killarney National Park in 1994 by his family and friends. The name of this great and good man is largely forgotten in his native Ireland." Our Aim, You Can Help ..
You can play your part by learning what you can about the Monsignor and spreading the fabulous story to whoever you meet, in particular to the next generation.